Full mobility, without exhaust emissions and cables. 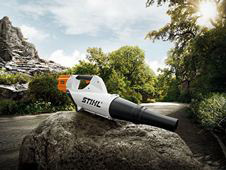 For those that don't want to annoy their neighbours, STIHL offers a high performance 36V lithium-ion battery blower. Mobile, quiet, powerful and just right for use in noise-sensitive areas such as schools, community gardens and hospitals. With a powerful lithium-ion battery and high torque EC motor it cleans with a push of a button.